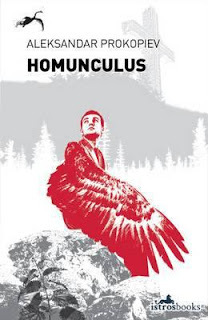 Penned by Alexandar Prokopiev, a Macedonian man of letters, Homunculus serves as a door to the wonderland of fairy tales for the reader of the postmodern world. Translated into English by Will Firth, this collection of sixteen stories has been supported by the Cultural Programme under the aegis of the European Union. The book’s prestige may be a source of pride for its publisher, Istros Books, as Prokopiev’s caboodle of stories won the Balkanika Prize in 2012. Moreover, Prokopiev’s collection has been counted among various cultural positions in the European Literature Network. A bundle of literary facts, prestige of the author, and wordy ovations are not what draw the readers to the new world of the wonderland. As a good vintage wine, with each short story Prokopiev’s collection unravels an array of flavors of his literary dish. Identifying with a postmodernist perception of culture and literature, the lecturer from Skopje reaches for the most interesting pieces of folk culture and transforms them to create a totally modern blend of myths tailored to the human condition of the 21st century. Elusive and tangible, multi-textual and uniform, the stories balance on the boundary of two worlds—the common fantastic and the unreal mundane. As Fiona Sampson, a British poet writes, Prokopiev “is a teasing, telling interlocutor who likes to play the naïve” (p.7) before opening a main course of witty prose. Thus, to whet our appetites, he offers an aperitif—an aphoristic joke, a teasing bit of advice on how to ‘use’ a fairy-tale. Such a literary manual not only puts a smile on your face, but in a slick way encourages readers to revise their views on our often superfluous understanding of ‘fairy-tales.’ Oftentimes, our associations are as stereotypic and mundane as the appearances of the first short story, ‘Tom Thumb.’ A crafty allusion to English folklore, the title is unlike the content it represents. The eponymous character, a troubled boy incarcerated in the juvenile detention center, weaves a story of his life and a path to the criminal world. Love deprivation, a slow downfall of self-esteem, loneliness and envy are all the ingredients of a daily existence of troubled teenagers we hear in the psychologists’ rants. This intimate story of personal distress is a rather painful repetition of a fairy tale of puberty in a broken family. A touching flash story, ‘Snakelet,’ the narrator in its direct simplicity, introduces the readers into the world of an alienated man who befriends a tiny snake who later becomes his companion. Sincere but incomplete, full but devoid of words, the relationship between the man and the reptilian serves both as a metaphor and a surrogate of a true friendship. Its value and beauty are tested once the man attempts to seeks the company of his own kind. A trial and a test of one’s determination do not leave out the protagonist of ‘The Man with One Wing.’ A hybrid between a human being and a bird, he was incapable of accepting his imperfection. Unable to fly with only one wing nor live like an average human being, he was caged by his own anguish. His worldview starts to shift dramatically once a life-changing challenge makes him face a reality he has never thought plausible. Bequeathing an incredible legacy, he undertakes a flight to uncover his true potential, and find a treasure beyond his imagination. A true, life-inspiring story in a lyrical way propels the readers to overcome the limitations to be rewarded with twice as much as one wing can offer. Simple in wording but profound in meaning, ‘The Man with One Wing’ is a model fairy-tale for adults, replacing countless spark-your-motivation books that build on a desire for success, but evade the most vital propeller of human existence: love and the need for community. Whenever you are soaring high at the welkin or living on the surface of earth, love is the component conditioning your life. ‘Marko’s Little Sister’, another flash-story, is set in a seemingly merry time of Christmas. Laden with the vanilla-sprinkled atmosphere of a family’s preparations for holiday, a crack emerges. Like a wrinkle on a freshly-ironed sheet, it distorts the lucre image of happiness. A kismet of an incoming tragedy, it explodes in the character’s future, proving that those things that cannot be altered stand hand in hand with those one can influence. Changing the course of events is what characterizes ‘The Huntsman,’ a travesty of the popular fairy-tale, Snow White. Contrary to the original text, the story concentrates on picturing the vicissitudes of a previously episodic character—the huntsman. Known for his ability to show mercy, in Prokopiev’s writing, the eponymous character becomes a fully-fledged man with all his weaknesses and desires. The story records his rise to glory, a romance with a voluptuous femme-fatale—the Queen who is a prisoner of jealousy and healthy lifestyle. Crafty, turgid and observant, the text parasites on well-trodden conventions, gladly abolishing their oligarchic rule. Not only the major characters but also values are replaced; intrigue, ailing relationships and dark eroticism—these are the qualities of Snow White’s world, or, to be precise—the huntsman’s little universe. For a new perspective inspires a new version of events, replacing the sweet topping of the original tale with a James Bond diary. Be it a fairy-tale, a flash of memories, or a memoir, Prokopiev appears to have a soft spot for irony. The parable-like ‘The Haji, the Shoemaker and the Fool’ describes the lives of three characters—representatives of titular trades—who, on their mutual journey, undertake different goals determining the outcome of their future lives. Powerful in its poignancy, the story presents an array of worldviews on what is considered invaluable in this world with a hint at how to achieve your goals, regardless of how down-to-earth they may be. A question of achievement and the obsession to which one’s ambitions may lead constitutes the subject of the story called simply ‘Homunculus.’ Depicting an experiment conducted by a teacher and his apprentice on the less advanced representatives of homo sapiens, it raises the issues of control, regime and the limitations of power. In the pseudo-scientific approach of a 19th century researcher, the narrator craftily dehumanizes the position of a man—a sentient being, and thus, a person, treating him as a guinea pig. Ripped from dignity, as a mere object of observation, the man can be viewed from a totally different angle: as a feeble and powerless creature who is prone to manipulation. In its gloominess, the story reverberates the last sentences of ‘Human, All Too Human’ (another story in Prokopiev’s collection) in which a human being is but “an ant, an insignificant speck in the impersonality of time.” (49) Petty lives for his??? ambitions—is that all that can be said about mankind? I dare to disagree. Fatalism, however present, does not seem to be Prokopiev’s rhetoric. As a researcher in the field of literature, he utilizes a variorum of its tools to probe a wonderful playground which is, for him, the shifting sands of the human condition. Gloomy and touching, the short (or even flash) stories form a cycle of tales each revolving around a universe, both fantastic and real. Touching upon a number of genres (memoir, diary, drama) Prokopiev’s Homonculus: Fairy Tales From the Left Pocket is a treasure trove of literary knowledge and wisdom about the world. Most of all, it is a tale with a moral that stretches far beyond the borders of countries and ideologies to win the hearts and minds of all readers around the globe. This sounds very worth reading. I am going to look for it now.